The Kreta Ayer Complex was built in 1981 as a part of the urban renewal of the Chinatown. It was renamed Chinatown Complex in 1984. Hence, when the market and food centre within the complex was completed in that year, it was named Chinatown Complex Market and Food Centre. The complex had been a crucial part of the government’s effort to provide a final solution to the thousands of street hawkers who were still plying their trade illegally throughout the streets of Chinatown. As they depended on this trade for their livelihood, it was not a problem the government could solve easily. The establishment of the colossal Chinatown Complex right at the heart of the street hawker district, Smith, Trengganu, Pagoda and Temple Streets, provided the permanent solution. When the last Chinatown street hawkers moved into the newly completed $18 million complex in October 1983, 300 street hawkers from the surrounding streets were resettled there. This paved the way for the dismantling of all the wooden stalls and shelters that obstructed the roads around, and it was said that, for the first time, the streets were quiet and empty. In reality, the clearance of all the hawkers from the streets allowed the government to thoroughly clean up the district, clearing the drains and eradicating the insects and rodents. The resettlement of the street hawkers at this time also led to a fear that the government would wipe away years of Chinatown heritage and tradition. The street hawkers had been part of the Chinatown street scene even before World War II, and had become synonymous with the social-cultural identity of the Chinatown district. 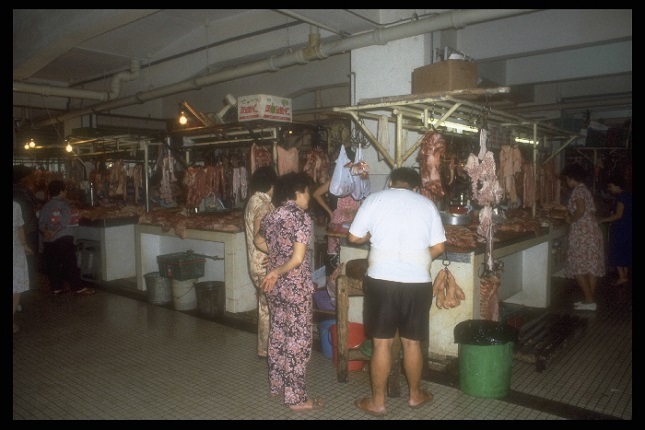 It was feared that removing the last of them into high-rise food centres and markets would erode the character of what was traditional Chinatown. With this concern in mind, care was given on the architecture of the building, which was designed to blend with the Chinatown streetscape. The new complex is endowed with Chinese elements like pavilions, columns, motifs, arches, clay-tiles, pitch roofs, covered walkways, tall windows and a rooftop garden which was similar to the concept of the courtyard in the old Chinatown buildings. The market and food centre also has wide thoroughfares on the ground level which provide ample space for mass movement, an important feature during festive times when the place will be overwhelmed. While the food centre is located in the second level, the wet market occupies the basement and the sundry shops are on the ground level. The car park occupies the fourth and fifth levels. The creation of the upper level parking spaces and the basement wet market area had been a crucial part of the design for the complex as it is built in the heart of Singapore’s central district where land is scarce and valuable. The Housing and Development Board would periodically upgrade the food centre and market in the 1990s to improve the facilities there. In 1991, fixed tables and chairs were installed. In 1996, the centre installed a new sanitation system. Then in 2006, the centre was upgraded once more. When it reopened in 2008, the complex had more than 700 stalls. It was the most extensive upgrading project done by NEA then, and it cost $20.9 million. Through the years, the new complex had been home for all the street hawkers who had been the living heritage of the traditional foods and trade of Chinatown. Many of them had remained at the complex for decades. By 2016, there were still about 20% of the original hawkers who could be found at the cooked food zone of the complex.